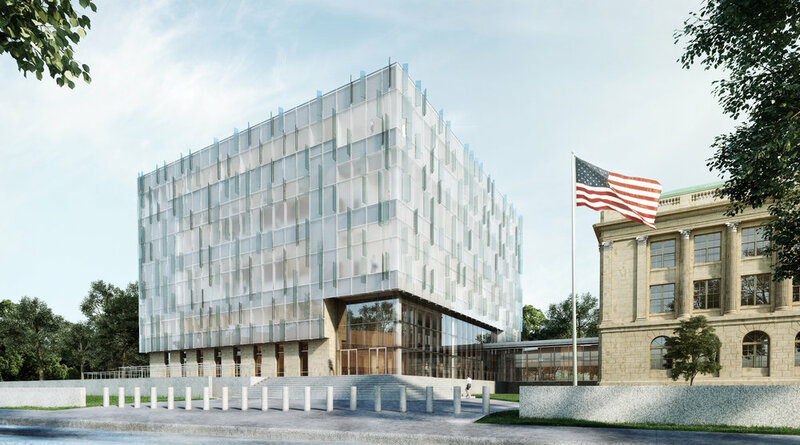 The U.S. General Services Administration (GSA) today unveiled the design for the new annex at the James M. and Thomas W.L. Ashley U.S. Courthouse in Toledo, Ohio. The annex design, which pays tribute to Toledo’s historic role in the nation’s glass industry, further defines the Toledo Civic Center Mall. Schooley Caldwell (with Schwartz Silver) was awarded the contract for design, management, and inspection services for Toledo’s planned federal courthouse renovation and new annex project. The $104 million project allows GSA to construct a nearly 96,000 square foot courthouse annex and to fully renovate the existing historic Ashley U.S. Courthouse. The concept design for the annex features a geometric glass structure that sits atop a raised base. This structure celebrates the glass manufacturing heritage of Toledo, and also maximizes natural daylight, views and visual connection to the Civic Center Mall. The renovations to the existing courthouse include upgrades to mechanical, electrical, plumbing and life safety systems, elevator modernization, accessibility upgrades, tenant improvements, and façade repairs for the existing courthouse.